The Campus Sustainability Revolving Fund is currently taking applications for energy and water conservation projects. Once approved these projects will start saving energy, water and reduce utility costs. The University of Saskatchewan has a wide variety of buildings of varying sizes and types. Water use at these facilities differs greatly depending on the type of building we are considering. 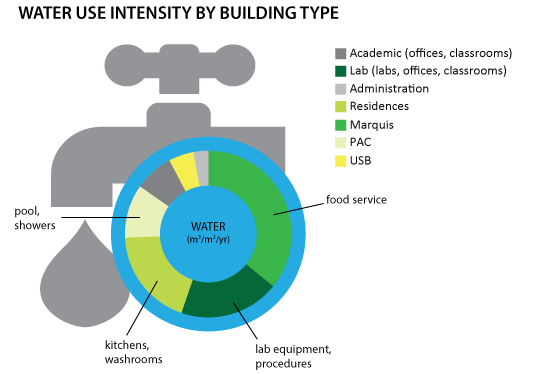 Water use intensity (WUI, measured in building water use/unit area of building floor space/year) allows for comparison of the water consumed in buildings of different sizes. Some types of buildings use more water than others because of activities in the buildings. The figure below shows the WUIs of campus building types relative to each other. Lab buildings typically use more water for research equipment and procedures. Food service for tens of thousands of people requires large volumes of water for food preparation and cleanup. Just as in your home, considerable water is used in residences in kitchens and washrooms. The Physical Activity Complex (PAC) uses water for the pool and provides showering facilities for the hundreds of individuals using the facility daily. The university is committed to using water efficiently, wisely and responsibly. On October 9, 2014, the university's Board of Governors approved the Energy and Water Conservation Policy.